There were many colleagues, both current and former, who wanted to offer their thanks to Director of Higher Education Lars Rydberg who is retiring after 40 years at LiU. 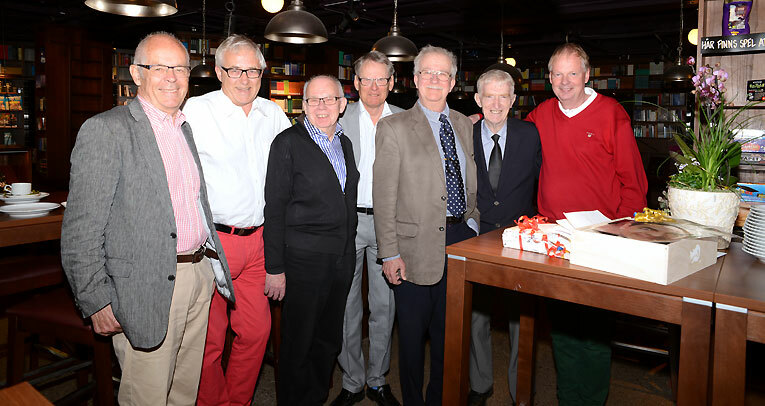 There was a large turnout at Lars Rydberg’s sending off after a long career at the university. He began in the autumn of 1975 as a teacher at the Department of Mathematics where he stayed for ten years. Between 1985 and 1992 Lars Rydberg worked as faculty programme director and head of faculty office in the Faculty of Arts and Sciences before he moved over to the vice-chancellor’s office where he worked mostly as director of planning and in recent years as director of higher education. After a long career there were naturally a lot of people who wanted to be there to see off Lars Rydberg. Including former colleagues. In the picture we can see jack-of-all-trades Christer Knuthammar, former University Director Curt Karlsson, recently departed Comptroller Christer Eklöf, Taisto Maaniidi from the student centre, Gunnar Wenngren from University Services, Sven Erik Karlsson, also a former comptroller, and Lars Rydberg himself.